If you use Android 4.2, or the Control Panel app, this next concept won't be all that new, but the implementation is fairly nice. iOS 7 is getting a new feature called Control Center, which is essentially a tray that lives at the bottom of your screen and brings quick actions to your fingertips. 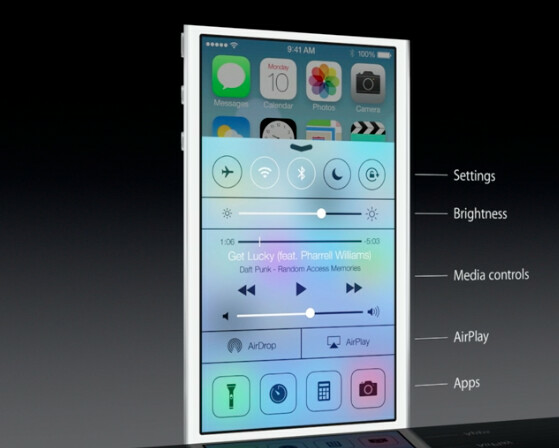 To bring up Control Center, you'll just swipe up from the bottom of the screen, no matter if you're in an app or not. The quick actions located there include system toggles like WiFi, Bluetooth, Airplane Mode, and display brightness, as well as quick links to certain apps, like Flashlight, alarms, calculator, and camera. In the middle of the Control Center is a dedicated music control section that seems to be persistent, whether you're listening to music or not, so you can start up some tunes whenever you want. Overall, it adds a number of functions to an easy-to-access tray, and separating the tray from the notifications tray seems like a good idea. The only issue we can see with Control Center is that while the icons have been simplified, the tray as a whole is pretty jam packed with stuff. In normal use, it probably won't be an issue, but it definitely looks a little busy compared to the cleaner UI being put forth in iOS 7. I do like the way it looks. But really though apple is years behind. I was actually excited to see how IOS 7. 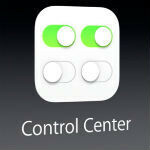 I like the idea of having these common settings so centralized for easy control. Hope WP is taking notes. I better see some improvements in WP8 soon, not iterative yearly updates that don't address deficiencies in the system. I'm just a little disappointed because all of this stuff AND MORE has already been available on Android. Damned if they do, damned if they don't. If they didn't add these features, they would be criticized for "being behind the times". And now that they did, they're being called WP/Android copiers. These are nice additions for iOS users who don't want to use Android or WP. Good points on iOS users getting some functionality, but what I was getting at was that Apple didn't bring anything "new" to the mobile space with respect to user features. These are all things that people have been doing with phones for quite some time now. This OS is a "catch up" version with a great theme. They aren't damned if they do or damned if they don't. There's nothing wrong with being disappointed with the news, especially considering I'm familiar with all of these features. Doesn't matter if your familiar. Not everyone wants an android or windows phone. Now that iOS has those features it just makes it so much better. It's better for iOS users. We're not talking about what Android/WP has or doesn't have. But its not about what others have or don't have per se. It's about what is already available in the marketplace. Nothing "new" was brought to the table. That's the disappointment. Forget that iPhones never had some of these things. Think bigger picture. Is any of this stuff "new"? Its great for the iPhone, sure but how did they raise the bar? Read my post below. Apple isn't innovating anymore as far as iOS is concerned. This update is for the things iOS users have been asking for, not for catering to Android users. Did you hear Cook act as if Apple invented photo filters and multitasking, and calling them "magical"? No. He basically stuck to the facts. Yeah he took a couple shots at Samsung, but that's to be expected. That's not the point. I as a potential consumer am disappointed because none of these are "new" features. It doesn't mean I don't like them, nor does it mean that it's not good for Apple and their user base. However, I am disappointed. I expected more and I don't see why I shouldn't have expected more. It goes like new features aside these OS's have a core that is basically how they are used some people prefer iOS some Android some WP and even Blackberry. Specific feature are impossible to be really that much different now a days without already seeing it creativity can only go so far without killing usability, So if you buy a phone based on a specific feature thats a bad decision in the first place. What is going to make you love that OS is that core the foundation not specific features. Thats just add-ons to the experience. I feel like trolls and fanboys can skew the interpretation of an honest opinion. For the record...I am an iOS user! I own an iPhone and iPad. They are great devices, but iOS 7 doesn't really impress me. So the purchases I've made and will make are uneducated and bad decisions? You can determine the DECISION process a person goes through off of a few posts on the internet? I will admit Steve Jobs arrogance definitely kind of ruined it for Apple now (calling new features "magical" even though they were standard on other platforms). Now everyone, especially the media, expects them to blow our minds out with new innovations, be it hardware or software. They need to remember that Jobs is gone. This isn't the same Apple like back in 2007. I really don't see Cook remaining the CEO much longer, especially if stock prices continue to tumble. I love the new functions and look! Nothing new. But, Apple did do a nice job on the way it looks. Sleeky looking. I'm sure iOS user will find this very useful. Its about time they implemented this yes they have taken features from wp and android but at least they have implemented them. If they did not everyone would complain. Still I thought they would add more jail break features! This is great news, we get Android features, and won't have to deal with the lag and crappy Android anymore. All we need for Apple to start support the party software. I don't know why they don't add 3G on/off toggle ?